From its solid Sitka spruce top and Sapele laminate back and sides, to its tropical American mahogany neck, ebony fretboard and mother-of-pearl inlays; this beauty will be sure to make heads turn no matter where you go. But it is the sound of the 114 that makes the grandest impression of all. 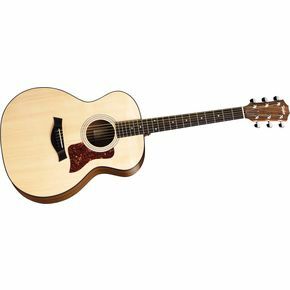 Built with the beginning guitarist in mind, the Taylor 114 has a round shape and a thin neck that makes it easy to handle, even for younger or more slightly built players. And its tone is a happy one; light and bright, it puts one in mind of birds singing, though it tends to emphasize the higher notes which can be annoying if you don’t have a strong handle on your playing style. While it takes a little more work to get the lower notes to play up to their full potential a good fingerstyle player or flat picker will have no problem getting it to produce, especially if you choose the right weight strings for your particular style of playing. Any way you look at it, this guitar is an awesome deal. You get a great looking and easily handled guitar with the Taylor tone and quality (as well as a gig bag!) for <$700, a combination which is bound to make its own grand impression.